Flooring is necessary in all buildings, including commercial warehouses, barns or homes. You can also choose to complete the look of your ClearSpan Fabric Structure with a variety of TekSupply flooring products. From functional to decorative, this product line includes a vast array of flooring for all sorts of applications. If you choose to install your building on the ground rather than on a concrete slab or pad, it is recommended that you install some sort of flooring to create a vapor-tight and weed-blocking barrier to protect your materials and equipment and also keep them dry. ClearSpan Floor Covering: If you decide to purchase a ClearSpan building to keep your equipment or materials protected, it may be a good idea to install ClearSpan Floor Covering so your materials aren't affected by rain or snow. This flooring is made of durable 16 mil silver/white polyethylene. The UV-protected fabric is long lasting and easy to secure with floor strips and 11-gauge steel wire fabric security staples. Not only will ClearSpan Floor Covering greatly improve weed control inside the building, it also reduces condensation by acting as a vapor barrier, keeping your valuable equipment and supplies off the ground and protected. In large manufacturing and production warehouses, floors are often made of concrete or other extremely hard materials. Having employees stand on concrete floors all day is taxing on their legs and back. In order to keep workers happy and healthy, floor mats should be placed over well-traveled areas, as well as in places where workers are stationary for long periods of time. Floor mats can also provide an easy-to-clean environment with excellent drainage for water or other liquids. They reduce the chances of someone slipping due to a spill, creating a safer working environment for employees. Comfy Mats: Comfy Mats are perfect for preventing fatigue in areas where people spend long periods of time standing. 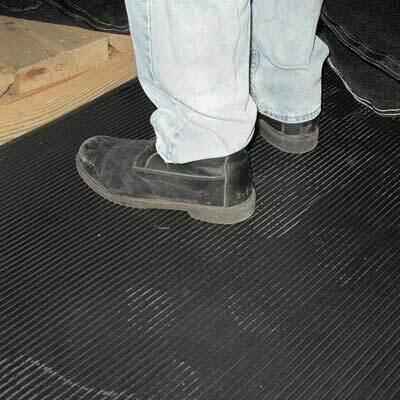 These mats can be placed on hard flooring in areas such as garages, workshops or skating rinks. Virtually indestructible, these ½" thick mats reduce stress on leg muscles and help increase blood flow. They are ideal for warehouses and workshops, as they greatly reduce noise and vibrations, create a nonslip work area and resist oil and chemicals. While most areas of your home are already outfitted with proper flooring, in some spaces, such as the attic or outdoor areas, you may need to install flooring yourself. Attics should have inexpensive, easy-to-install and sturdy floors. 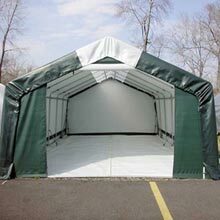 This will create additional safe and durable storage space. Around the yard, a pathway or patio can add a finished look to your garden or pool area. This type of flooring is also easier to maintain than traditional landscaping and creates a safe and slip-free patio around areas that tend to be wet. PolyMax® Attic Flooring: Available in overlapping and nonoverlapping styles, this flooring is made from non-porous polypropylene and inhibits bacteria growth. Flooring panels can be cut to any dimension and are easy to install in tight spaces such as your attic or crawl space. PolyMax® Attic Flooring is low maintenance, making it an ideal choice for hard-to-reach places. Champion PaverBlocks™: PaverBlocks™ offer a safe, nonslip surface for walkways, patios, playgrounds and more. Red in color, these blocks are manufactured from 100% recycled tire rubber. 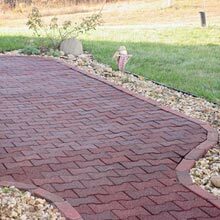 The self-draining quality of these PaverBlocks™ makes them ideal for areas where puddles can be an issue. Champion PaverBlocks™ are very attractive, sound absorbing and comfortable, making them the perfect addition to your yard, garden or pool area. 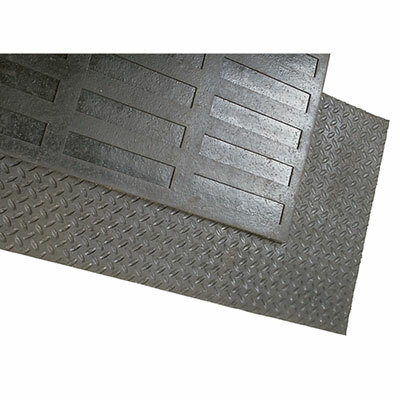 Dyno Rubber Utility Mats: These mats can be used in a variety of applications from dairy and equine barns to garages and exercise areas. Available in ¼" thickness, these mats are made of fully vulcanized rubber and have a textured surface to improve traction. 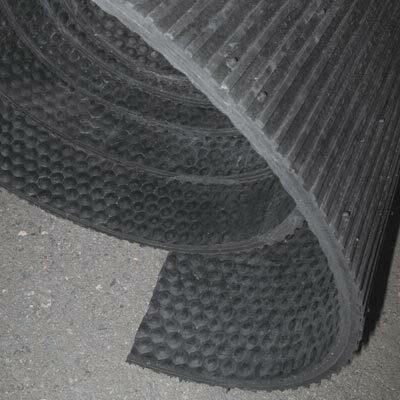 The grooved bottoms of the mats provide excellent drainage, preventing water buildup and extending useful life. They are lightweight and great for traveling to horse or dairy shows. Dyno Heavy-Duty Interlocking EVA Mats: Ideal for people, small animals and more, these EVA (closed cell foam) mats reduce leg and back fatigue. These high-quality EVA mats have interlocking sides, making it easy to cover any size or shape area necessary. Easy to clean and disinfect, these mats are vapor tight and nonabsorbent. Dyno Alley Mats: These mats are great for your home, ranch, farm and business for all sorts of applications only limited by your imagination. We recommend using them for your trailers, barn alleys and stall walls. Custom sizes to fit your needs are available on request. 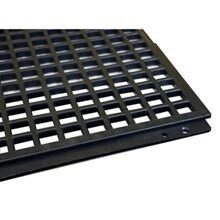 Heavy-Duty Rubber Ring Mat: This mat is ideal for any application where good drainage is needed, including stall mats, wash stalls, kennels, grass retention, soil stabilization, under driveways and under walkways. Rings mats are made of a mixture of virgin and recycled rubber to create comfortable and resilient flooring for animals and humans. 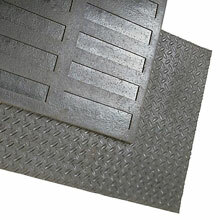 Mats are raised slightly to allow liquids to drain through the holes, under the mat and into the subfloor drain. These mats are environmentally friendly and can be used indoors or out. What is the difference between EVA and rubber mats? EVA (ethylene vinyl acetate) mats are much lighter than rubber mats, making them ideal for temporary use due to their portability. They can also be used permanently in stall applications due to their durability and long life. The softness and anti-fatigue qualities of the EVA foam make them a safe option for livestock and humans. They are often used for exercising due to their shock-absorbing nature and incredible flex. This foam flooring has noise-reducing qualities and also provides great heat insulation for the floor. Maintenance is easy with EVA mats, since they are stain-resistant and only need to be swept or mopped on occasion. While rubber mats can be placed inside or outside, we do not recommend using EVA mats outdoors. If left in direct sunlight, the color of an EVA mat will fade with time, while rubber does not. Also, rubber mats allow for drainage, while EVA mats do not allow liquid through at all. Flooring can be used in your greenhouse or high tunnel for a few reasons. First, some types of flooring can be used to create a vapor-tight and weed-free environment inside the structure, especially if you are growing plants in the ground. Also, adding reflective flooring to your greenhouse reduces the need for artificial lighting, as the light is reflected and reused, rather than absorbed into the ground. Black/White Silage Film: This 5 mil film is not only an excellent black out film, but works well as reflective ground cover. 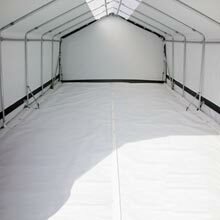 In a greenhouse or high tunnel, place silage film on the ground to reflect light to your plant's lower leaves. The reflected light is ideal for ground and bench crops. When growing tomatoes with silage film on the greenhouse floor, it has been proven that yields can increase up to 27%. If used with reflective film covers as well, crops tend to have lower root zone temperatures, which is critical during summer productions. Black/White Silage Film has excellent tear and puncture resistance, and works well as a weed and moisture barrier, protecting your crops from elements outside the greenhouse or high tunnel. PolyMax® Reflective Greenhouse Flooring: If you are looking to keep your plants' environment warm and maintain better heat distribution while reducing energy costs, Reflective Greenhouse Flooring is an ideal choice for your high tunnel or greenhouse. This reflective flooring can be installed on the ground of your greenhouse or high tunnel to act as a vapor barrier and prevent weeds from getting to your crops. This 14 mil material is manufactured from woven polyethylene and has superior UV resistance. When installing Reflective Greenhouse Flooring, the white side should be face up in order to reflect the light back up at the plants. By reflecting much of the light entering the greenhouse, rather than allowing it to be absorbed into the ground, you are providing your plants with better lighting conditions in the growing area in a cost-effective and efficient way. The black bottom surface of this flooring inhibits weed growth and stops pests from getting to your crops. Using Reflective Greenhouse Flooring greatly reduces the need for pesticides and artificial lighting. Reflective Flooring also acts as a vapor barrier, preventing the spread of soil-borne diseases and helps plants withstand long bouts of hot or cold extremes. Weed Guard Ground Cover: Weed Guard Ground Cover is available in standard and heavy-duty weights to suppress weed growth while allowing air, water and nutrients to pass through to the plants. This ground cover can be used inside your greenhouse or high tunnel to prevent weeds from growing inside the structure, while conserving soil moisture. Standard Ground Cover is manufactured from a UV-resistant 3 oz. per sq. yd. black polyethylene. 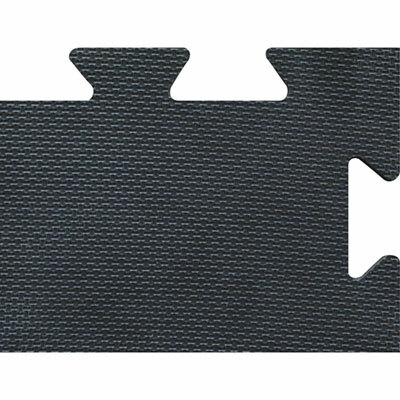 The Heavy-Duty Ground Cover is made from a black 4.1 oz., 30 mil woven black polyethylene. We recommend the Heavy-Duty option for commercial landscaping operations. There are many different areas around your farm where flooring is a must. First, matting is recommended as a base in stalls, as the packed dirt or concrete the barn is built on can create unnecessary stress on the legs and backs of you and your livestock. Also, barn aisles should have mats to make them easy to clean, preventing the spread of bacteria and disease. Wash stalls need mats for the same reason. Basically, anywhere you or your livestock spend an extended period of time is an excellent place for floor mats. In a poultry or dairy barn, it is especially important to avoid the spread of bacteria and disease. In these instances, floor and bio-security mats can protect your livestock and livelihood by creating a clean, disease-free environment. ValuMats: These mats are ideal for milking parlors, equine wash stalls, restaurants and workstations because they provide great air circulation, comfort and increased productivity. You can buy as many 3' by 3' square mats as you need and interlock them to cover your entire floor. 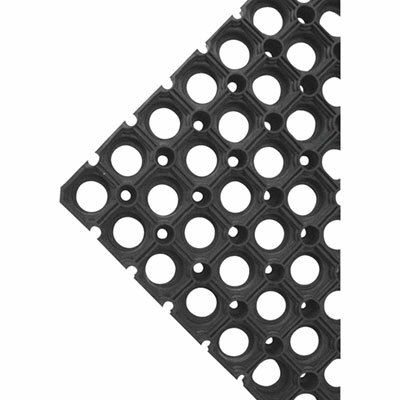 The holes in this ½" thick mat provide excellent drainage, preventing the buildup of dirty water. Combined with their slip-resistant footing, these characteristics make this mat ideal for wash stalls. The soft footing of the mat relieves both leg and back strain in horses and humans, making them not only safe, but comfortable. Bio-Security Mats: Bio-Security Mats help prevent the spread of disease in milking parlors, poultry houses and more. Made of foam, Bio-Security Mats help prevent hoof and foot problems from being passed from animal to animal. These mats are much easier to use for heavy livestock because the animals aren't forced to step and stand in a bucket, which can often create a mess. When the animals step on the mat, their weight forces the disinfectant around and under their hooves. Great for indoor or outdoor use, these mats are ideal for human, vehicle and livestock traffic. Dyno Interlocking Rubber Stall Mats: Manufactured from 100% re-vulcanized and recycled rubber, these stall mats are resilient, cost effective and beneficial to your horses' health and well being. Rubber Stall Mats are comfortable when standing for long periods and reduce the strain on bones and muscles, while providing dust control in the stall. The tight-fitting interlocks help prevent urine and other liquids from seeping through the mats, keeping stalls clean and sanitary. Horses will not be able to pull or move mats as they hold themselves in place without walls or fasteners.